Start your engines and take a seat behind the wheel of one of several true to original buses. Freedom is everywhere: You can drive through a big city completely free anytime you like. Moreover, you can also create your own schedules or change to another line at the bus station. Keep an eye on the timetable as well as the traffic rules. Theres a speed limit even on the highway and country road. Pay attention to the lively city traffic. In addition to bus lines you can also accept special tours with coaches. Change the look of your buses and even your own! 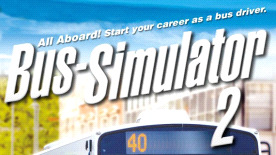 Bus-Simulator 2009 lets simulation fans take on the role of a bus driver realistically. Ticket sale, vehicle management, voice announcements, changing of display, animated real time cockpit instruments and much more creates an extra portion of realism. A big city including a harbor, villages, highways and country roads is waiting. Enjoy your new freedom in bus driving!